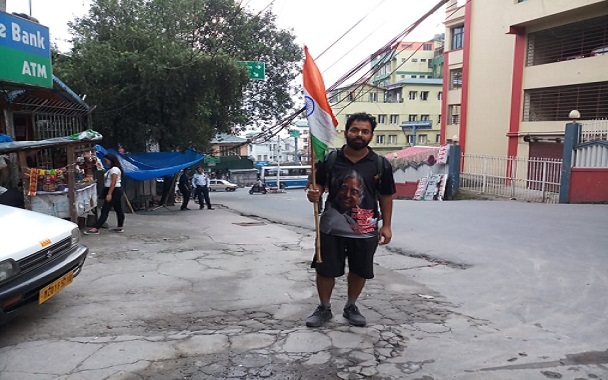 On the trail of his ‘Beggar-free India’ campaign beginning on foot from Jammu Ashish Sharma has reached Aizwal Monday and headed for the western Mamit town of Mizoram 112 kilomtres from here. Ashish Sharma, 29, who hails from Delhi and is a mechanical engineer by profession has sacrificed his job in a multi-national company as well as family and started campaigning for ‘Beggar-free India.’ He has now set a target to travel across the nation spreading the word to eradicate beggary from the country. He has planned to travel 17,000 kms across the nation and has already covered 8,956 kms. In an interaction with media persons Ashish Sharma narrated how one evening returning home from work he saw a thin and lean child with a bleeding hand, begging. Moved by the pathetic sight, he took the child home, gave him first aid, some new clothes and got him enrolled in a nearby school run by an NGO. The incident changed his life. In the year 2015, Sharma decided to quit his job to pursue his dream, eradication of child begging. “After doing extensive research, I concluded that the condition was going from bad to worse. The government-run welfare schemes were not reaching those who actually deserved them, because of lack of awareness,” he said. Then he decided to embark upon the country-wide foot march to create awareness among the masses. “We cannot make people aware unless we meet them personally and a countrywide tour was perhaps the best way to meet the masses,” he said. His started his journey from Jammu on August 22, 2017 covered Jammu, Himachal Pradesh, Punjab, Haryana, Rajasthan, Gujrat, Daman, Silvasa, Maharastra, Goa, Madhya Pradesh, Uttarakhand , Uttar Pradesh, Bihar, Sikkim, Assam, Arunachal Pradesh, Nagaland, Manipur and now Mizoram. He said he travelled around 30 to 40 km a day and met thousands of people to make them aware of the welfare schemes that could change an individual’s life. So far, he has covered around 8,956 km in 20 states. Ashish Sharma plans to remain in North East for 49 days after that he will leave for West Bengal to complete travelling through the northeast region. He met the chief minister of Mizoram Lal Thanhawla on Monday before another tedious Mamit trek.